Full schedule and list of student research presentations. The annual Student Research Day at St. Francis Xavier University was started in March 2003 by Dr. Angie Kolen-Thompson, an Associate Professor in the Department of Human Kinetics. She credits the idea to her own graduate student research experiences from which she adapted to suit the students at StFX. 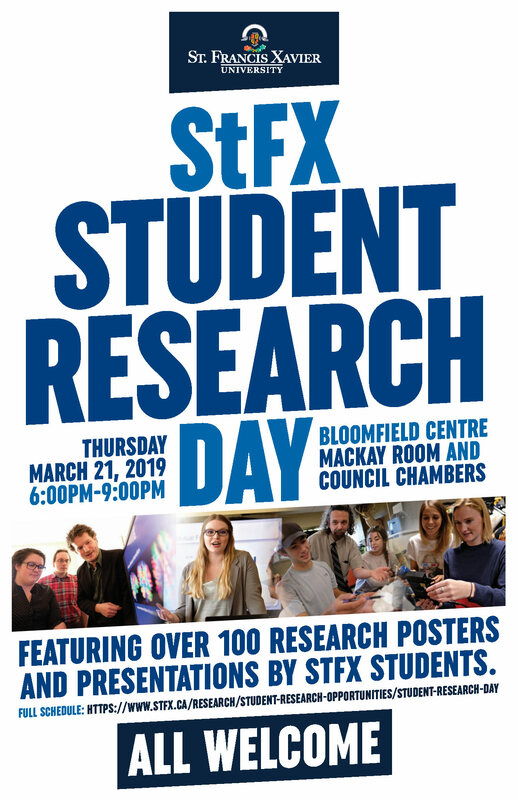 The Student Research Day gives students the opportunity to showcase their research or advanced studies undertaken as part of their upper-year classes, advanced majors, honours, or graduate programs. An evening is dedicated to displaying the students’ work in either an oral presentation or poster format with the presenting students available for a couple of hours to provide other students, faculty, staff, and interested community members with the opportunity to discuss the research presented. We can frame your degree!